Hired by Rotem Emprat Negev Company Ltd, in 2005 Y.G. 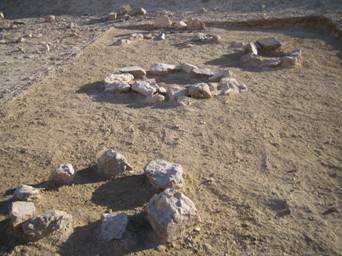 Contract Archaeology was contracted to excavate a number of archaeological sites at Hatrurim in the northern Negev. These had previously been identified by the Israel Antiquities Authority. The excavation project was directed by Y.G. Contract Archaeology executive Yehuda Govrin. The features we investigated at Hatrurim included small stone structures that appear to have served as cooking and fire places (Sites 4a-c, e, 5a), a larger enclosure-type structure (Site 4d), and various built features the function of which remains unclear. Some of these may have served a more symbolic or ritual purpose, due to their incorporation of standing stones of ‘stele’ form (Sites 4c, 6b). Very few artifacts were recovered. These were ceramic sherds cooking pots and lids of Byzantine (ca.330-638 CE) or Early Islamic (638-1099 CE) date. 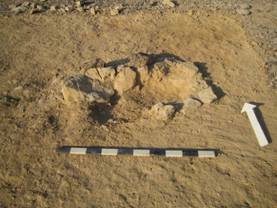 Our inference is that many of the features we investigated at Hatrurim reflected the activities and possibly the beliefs of a late pre-Islamic nomad population.